So I'm putting a pretty good dent in these guys. I'm a little over halfway done with them so far. Meaning I have 18 of them finished. 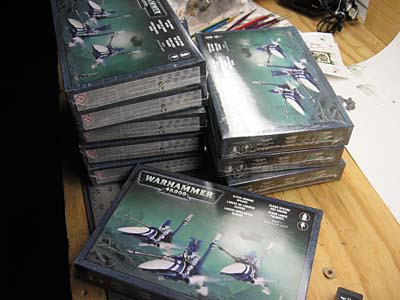 There's 27 jetbikes in all that I need to build, not including my Farseer or the handful of Vypers. Having bought a new house recently, my time will be somewhat limited very soon so I'm trying to get as much done as quickly as I can. I just picked up my last 3 Vypers last night too. Maybe this weekend I can put a dent in my squad of Warlocks and get them finished. Since this post is fairly old, I've decided to add a few links to some additional posts to help readers out. Sounds like the army is coming along nicely, and quickly! You are right about the new house though. We just moved in the beginning of February and I'm just now getting settled enough to start working on stuff. Good luck! As a dedicated miniature wargamer you must aspire to paint the interior of your new house using only the fine detail brush. It is alot of bikes but they go quick when you're painting 3 to 6 at a time. Charles: My wife does the painting... I'm the money part of the operation. Ohh! when us see it like that, you have got a lot of painting to do. Best of luck with the new house. Andy: I'm still campaigning for a little bit of hobby space in the new place. It will be scaled back but I'm downplaying the whole thing so I don't draw any unecessary attention until after we move in. Alvin: I don't know about you but I had to break mine down into manageable chunks so it didn't seem overwhelming. Someone having a closeout sale on Shining Spears? Is that the most economical way to set up the army. I see that they are slightly cheaper than 3 normal jetbikes individually? How about the Apoc formation set? Is that direct only cutting down on the savings available. This was the most economical way for me to go, my FLGS helped me out too! The Apoc boxed set (Windrider Host I think) is no longer available but it would have been even better. if you ever decide you want to get rid of some of the metal shining spear parts, drop me an email. I need a fair number of those parts. My email should be linked to my profile I'm posting this comment from. As soon as I finish my Warlocks, I'll drop you a line... I should have plenty of them left over. There's just something beautiful about seeing so many Shining Spear boxes.